U.S. Wheat Associates (USW) actively seeks to bring down trade barriers or change policies that may prevent an overseas customer from choosing U.S. wheat. In most cases, these barriers violate a country’s commitments under rules of either the World Trade Organization (WTO) or a free trade agreement (FTA). Every year, USW submits a report to the U.S. Trade Representative detailing these barriers. For the full report, click here. The sections below discuss several categories related to trade barriers, then provide specific examples of trade barriers alphabetically by country. Why are enforceable WTO disciplines important to wheat? WTO disciplines are effective because they are enforceable, and the possibility of enforcement helps resolve trade barriers. Thus, U.S. 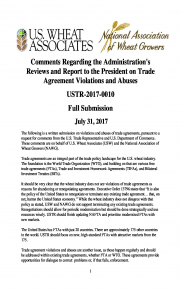 Wheat Associates strongly supports the WTO dispute settlement system, an effective Appellate Body and an aggressive, WTO-centric trade enforcement agenda as the best means to eliminate foreign trade barriers. The WTO rules are the trade policy foundation, but major gains can also be made through negotiating high-standard bilateral or plurilateral free trade agreements. Negotiations themselves are an opportunity to solve trade barriers, as are new commitments made once an agreement is reached. It should also be very clear that U.S. Wheat Associates does not see violations of trade agreements as reasons for abandoning or renegotiating agreements. Traditional trade barriers, e.g. tariffs, are still one of the biggest impediments to agricultural trade, even when imposed in full compliance with a country’s WTO commitments. 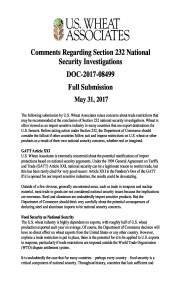 The sections on this page will not include separate discussions on tariff barriers, but they are a major problem for U.S. wheat exports in many parts of the world. The number of free trade agreements globally is increasing at a rapid pace. The United States has not completed an agreement since negotiating the U.S.-Korea FTA in 2007. Meanwhile, our competitors are aggressively negotiating new market access. Argentina, Australia, Canada, Russia, the Ukraine and the European Union (EU) have either concluded or are negotiating agreements with wheat importing countries that put U.S. wheat farmers at a price disadvantage due to tariff differences. The United States must be active in pursuing new trade opportunities to both maintain and increase export opportunities for U.S. wheat producers. Why are we concerned about certain kinds of domestic support (farm subsidies)? 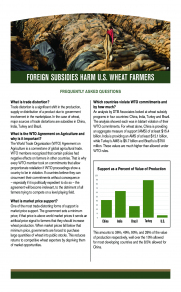 Domestic subsidies that exceed WTO commitment levels encourage overproduction, eliminate trade opportunities and lower global wheat prices, which reduces the incentive for farmers in the United States and elsewhere to grow wheat. The use of high support prices often results in surplus stocks, which sometimes become subsidized exports. A number of wheat producing countries – especially advanced developing countries – are providing trade-distorting subsidies beyond their allowable commitments through input subsidies and market price supports. 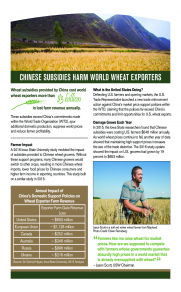 A 2015 econometric study and a China-specific follow-up study showed that these programs have substantial negative effects on U.S. wheat farmers. The U.S. challenge to China’s price support program at the WTO (DS511) was an important first step in correcting this trend. Are regulatory measures related to health and the environment ever designed as trade barriers? Sanitary and phytosanitary (SPS) regulatory standards around the world are a concern for U.S. Wheat Associates because these standards often disrupt trade. Since the conclusion of the Uruguay Round, which strengthened SPS rules and placed restrictions on the use of tariffs and quotas, importing countries have devoted more resources to developing and enforcing SPS regulations, and implementing new food safety standards. In some instances, U.S. Wheat Associates believes that many of these SPS requirements are not based on sound science, do not use the least trade distorting measures available, are based on misconceptions, and are motivated by purposes other than those allowed by the SPS agreement. Plant health regulations present some of the most intractable problems as some importing countries demand freedom from one or more pests that occur in the United States and may be present in wheat shipments. Plant health restrictions of most concern involve wheat diseases (most often fungal diseases) or weed seeds. It is critical to conduct scientific risk assessments to validate new regulations as they have the potential to eliminate the United States completely as a supplier to markets that have been historical customers. Residue and contaminant requirements are also proliferating. Many, if not most, importers now have regulations concerning pesticide residue tolerances. Once those are in place, limits on mycotoxin and heavy metal (cadmium and lead) content often follow. U.S. wheat virtually always conforms to these requirements, but the spread of unnecessarily stringent regulatory approaches and the uncertainty of differing requirements (testing delays, false positives or uneven enforcement) can discourage trade. 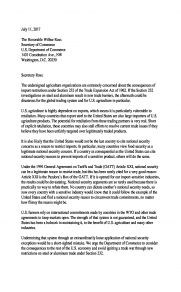 How could rules on biotechnology and other plant breeding act as trade barriers? Regulations limiting the import of commodities derived through biotechnology are a concern to U.S. Wheat Associates. While biotech wheat is not in commercial production in the United States, well-entrenched resistance to acceptance of commodities produced via biotechnology is a concern that inhibits progress toward development of biotech wheat varieties. The lack of standard tolerances for low-level presence can disrupt trade for commodities that do not even have commercial biotech varieties in production. U.S. Wheat Associates fully supports the U.S. government’s efforts to ensure that trade regulations of commodities derived through biotechnology be based on scientific evidence. Additionally, as new plant breeding innovations are more regularly used, it is important that we draw distinct regulatory line between traditional biotechnology and other technologies that can result in new varieties without the presence of foreign DNA. U.S. Wheat Associates encourages the U.S. government to closely monitor regulatory discussions on this topic and ensure that these technologies are not automatically categorized by regulation as “biotechnology”. Read more about USW’s efforts on these issues here. Could protectionist policies in the U.S. end up resulting in trade barriers for U.S. wheat exports? U.S. Wheat Associates opposes domestic U.S. policies that violate trade commitments or otherwise lead to retaliation that could potentially affect U.S. wheat exports. Particularly concerning are recent Section 232 tariffs on steel and aluminum that invoke national security to justify sweeping protection for U.S. companies. Food security has always been tied to national security, and U.S. Wheat Associates is seeking to avoid both retaliation by steel and aluminum exporters and imitation by importers looking to protect their domestic wheat producers. Learn more about Section 232 and the risks to the wheat industry here and here. Brazil made two primary wheat market access commitments when it joined the WTO. First, the maximum tariff (i.e. the bound rate) on imported wheat would be 55 percent. Second, Brazil would allow each year a 750,000 metric tons (MT) tariff rate quota (TRQ) of wheat to enter duty-free from most favored nation (MFN) origins, which are countries that do not have free trade agreements with Brazil. Today, Brazil applies a 10 percent tariff on non-Mercosur wheat that greatly reduces U.S. wheat’s competitiveness versus Argentine wheat. During the years when the Argentine government imposed export restrictions on wheat, Brazilian millers were sometimes forced to look elsewhere. U.S. wheat farmers benefited from the major shortfalls in Argentina’s crops. With recent changes in Argentine policies, big opportunities like these are less likely. However, on a level playing field with Mercosur, Brazilian millers could have consistent buying opportunities from all sources, especially when Brazilian and Argentine supplies are tight. The Premio para Escoamento de Produto (PEP) program and the Premio Equalizador Pago ao Produtor (PEPRO) programs act as export subsidies for wheat. These programs are actually structured in a similar manner to the former U.S. “Step 2” program that was used for cotton, which Brazil successfully challenged at the WTO. The U.S. lost on the argument that Step 2 is not an export subsidy because domestic destinations as well as export destinations were eligible for the subsidy. These programs were inactive for wheat in 2015, but resumed in 2016. Last year, wheat exports under PEP and PEPRO nearly reached a million tons. View the Brazil section of the Trade Barriers Report here. The primary market access barrier to Canada is that regardless of variety, all foreign grown grain automatically receives the lowest designation in the official grading system. This has a negative impact on export opportunities to Canada as it results in de facto segregation. Even if the wheat is an approved Canadian variety and of high quality – the result is the same. This puts U.S. grown wheat at a serious disadvantage, as it does not have equivalent access to Canada’s bulk handling system. The variety registration system (VRS) is also overly burdensome, involving criteria unrelated to quality or marketing to achieve a class designation, including agronomic requirements. While the VRS has been modernized over the past several years, the system still only allows a small amount of U.S. test plot data to be used, which makes it difficult for U.S. developers to register their varieties in Canada, especially in cases where the primary purpose of registration would be for importation, where agronomic concerns are irrelevant. This restrictive process of registering U.S. wheat varieties in Canada is not a practical solution. View the Canada section of the Trade Barriers Report here. China’s market price supports for wheat and other commodities have increased well beyond international prices in recent years, resulting in higher domestic support that exceeds WTO commitment levels. This has led to overproduction of wheat, to the point that China now holds almost half the world’s wheat stocks. Current Chinese programs displace otherwise strong demand for U.S. wheat and diminish sales opportunities. The programs reduce prices and increase market uncertainty. Market price support is one of the most trade distorting types of support because it relies on border controls or market interventions to prevent domestic prices from falling below the support level. Governments are obligated to maintain prices above the support level, and must purchase wheat that cannot be sold at higher prices. That is why China’s wheat stocks have grown to such extraordinary volumes. The WTO Agreement on Agriculture has a formula to estimate the size of these types of support compared to a country’s commitment levels. In its calculations, USTR found that for wheat, corn, and rice, China had exceeded its WTO commitment every year between 2012 and 2015, and that the level of support in excess of this commitment was nearly $100 billion. China’s wheat tariff rate quota (TRQ) was established in its WTO membership agreement in 2001. That agreement allows China to initially allocate 90 percent of the TRQ to be imported through government buyers, or state trading enterprises (STEs), with only 10 percent reserved for private sector importers. The private sector portion of the TRQ is functioning well enough to be filled in recent years, in part because Chinese millers are trying to meet growing demand for products that require flour from different wheat classes with better milling and baking characteristics than domestically produced wheat provides. However, China’s notifications to the WTO on TRQ usage show an average fill rate of only 23 percent. The facts also argue against potential claims that enforcing the TRQ agreement would threaten China’s food security. China produces more wheat each year than any other single country and currently holds an estimated 45 percent of the world’s abundant wheat supplies. If China met its 9.64 million metric tons [MMT] wheat TRQ, its farmers would still produce 90 percent of domestically consumed wheat. Opening the wheat TRQ would also allow private sector millers and food producers to import the types of wheat they say they need, but cannot now obtain, and the benefits would be passed on to China’s consumers. U.S. 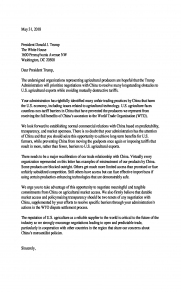 Wheat Associates supported the WTO cases launched by the Obama Administration on these two topics, and appreciate the Trump Administration’s support in continuing the effort. Read USW’s initial press releases here and here, and the release on subsequent actions here. View the China section of the Trade Barriers Report here. Not all trade barriers are foreign. The United States has imposed an economic, commercial and financial embargo on Cuba since 1962. Exports of U.S. agricultural products, including wheat, have been allowed since 2001 under the Trade Sanctions Reform Act (TSRA), but travel and financing restrictions make it difficult to conduct a free flow of trade. There have been no U.S. wheat exports since 2011 because travel and financing restrictions make it difficult to conduct a free flow of trade. 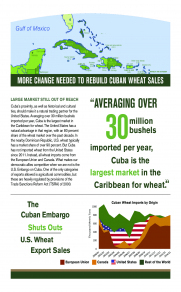 Cuba is the largest wheat market in the Caribbean and should be a natural buyer of U.S. wheat. Instead, all wheat imports come from our democratic allies in the European Union and Canada. U.S. Wheat Associates welcomed the December 2014 announcement that the United States would begin discussions to renew diplomatic relations with Cuba, as well as subsequent regulatory changes that marginally expanded trade and travel opportunities. However, the major impediments to trade in wheat remain in place. The EU increasingly approaches SPS regulations through a hazard-based approach — that is identifying potential hazards and banning them, regardless of the actual risk of exposure. Without science-based risk assessments that meet international standards, the EU risks disrupting trade in agricultural products and violating its WTO commitments. There is substantial risk that the EU will choose to prohibit residues of pesticides subject to risk-based analysis in the United States that are banned as hazards in the EU. This could have serious repercussions for wheat sales in the most significant export market for U.S. durum wheat. In violation of the EU’s single-market rules, Italy has recently imposed a labeling requirement for pasta sold in Italy based on the cultivation location of the durum used in pasta. This is a bureaucratic nightmare to implement and could lead to substantial changes in durum sourcing. Prior to the new rule, Italian semolina millers and pasta manufacturers could use durum from a wide variety of locations, including the United States, and blend and mix durum and semolina in whatever combination is needed to meet product quality specifications. This change will add significant costs to Italian companies trying to implement the policy, and will likely lead to reduced U.S. durum imports. View the EU section of the Trade Barriers Report here. India maintains high support prices for wheat in violation of its WTO commitments, leading to excess production and inflated public stocks. In some years, stocks have grown so large that India has exported wheat, a clear violation of WTO export subsidy rules. To make matters worse, India is constantly seeking to protect its trade-distorting stockholding program by preventing any multilateral trade agreements unless it gets its way. Essentially, India has attempted to create a permanent loophole for certain types of price support programs associated with state-run stockpiling programs. These types of price supports can be highly trade distorting, violating both WTO rules and the spirit of trade liberalization that the organization is meant to embody. U.S. Wheat Associates does not object to India holding public stocks for food security, which is critical for all countries. Public stockholding has always been included in the Agreement on Agriculture’s “Green Box” of non-trade distorting support, but with the recognition that administered prices (i.e. price supports) should be properly notified considering their potential to distort trade. There is no such restriction on purchases for public stocks using market prices, but that is not the type of program that India operates. View the India section of the Trade Barriers Report here. Despite one of the highest tariff barriers on wheat in the world (130 percent in recent years, though recently lowered to 45 percent), Turkey is the largest exporter of wheat flour by far. One might wonder how this could be, since protected industries are typically not globally dominant. The answer is that Turkey uses a complicated system of domestic price supports, state purchases, and a system known as inward processing, that result in subsidized flour exports. The inward processing policies encourage subsidized flour sales as flour exporters receive a certificate to import duty-free wheat when flour is exported. This system requires Turkish millers to export flour before receiving certificates allowing an equivalent amount of wheat imports duty-free. WTO rules allow this type of system, but Turkey has an obligation under the WTO Agreement on Subsidies and Countervailing Measures to maintain a verification system related to the use of the IPS. It is supposed to track how much product is imported and exported under the system, and check that exported wheat is of the same characteristics and kind as wheat exported under the IPS. There is no evidence of such a verification system. If Turkey does not maintain such a verification system, it is in violation of WTO rules. Turkish flour exports can be priced well below the market, displacing milling wheat exports from all origins. This has a particularly negative effect on U.S. Wheat Associates’ overseas customers, because it undercuts flour mill profits, resulting in slower growth, tighter margins, or milling industries operating well below capacity or even closing mills. View the Turkey section of the Trade Barriers Report here.